God bless America for spending $130 million to build a road dedicated to leisure motoring. That’s right, commercial vehicles are banned from the Blue Ridge Parkway that sweeps and swoops for 469 breathtaking miles over the Appalachian Mountains. Constructed between 1935 and 1987 and often called America’s favorite drive, the parkway drops to 649 feet in Virginia, reaches 6047 feet in North Carolina, and is stippled with such pleasing names as Yankee Horse Ridge, Bearwallow Gap, Purgatory Overlook, Devil’s Backbone, Daniel Boone’s Trace, and Little Switzerland. The road is flanked by beautiful trees and flowering shrubs-tulip, dogwood, birch, hemlock, flame azalea, rhododendron-but scenic overlooks provide mind-blowing views into deep valleys and over wooded mountains that delight today’s travelers as much as they challenged the pioneers years ago. Those tough, colorful days are recalled in Virginia’s Explore Park (www.explorepark.org), where buildings and characters in clothes from the eighteenth and nineteenth centuries give a vivid impression of what life was like for early settlers in this great wilderness. 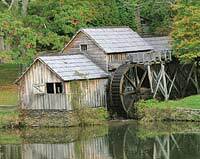 Sixty miles south is the picturesque water-powered mill built by Ed Mabry in 1910. If you’re lucky, your visit may coincide with traditional activities such as the blacksmith working in his forge while mountain maidens make sorghum and delicious apple butter. Virginia is beautiful, but the southward drive gets better and better beyond Asheville, North Carolina, amid scenery that helped inspire Thomas Wolfe’s Look Homeward, Angel. The 45-mph speed limit may seem absurdly low for such a beautifully engineered and lovingly maintained road with long, seductive curves, but even the keenest driver soon adjusts to the pace. That’s because nobody uses the Blue Ridge Parkway to get anywhere in a hurry. As its far-sighted planners intended all those years ago, this is a road to be sipped like a fine wine, not gulped down like a thirst-quenching beer. Peaks of Otter, Milepost 86 (800- 542-5927; www. peaksofotter.com). Lodge and restaurant in a gorgeous lake and mountain setting. Bluffs Lodge, Milepost 241 (336- 372-4499). No phones and no TV to disturb the tranquillity. Pisgah Inn, Milepost 408 (828-235-8228; www.pisgahinn. com). Breathtaking views from high on Mount Pisgah. Do book lodging in advance. Do take a detour to visit the Wheels Through Time museum (828- 926-6266; www. wheelsthroughtime.com) in Maggie Valley, North Carolina. There’s a splendid assortment of historic cars and rare American motorbikes. Don’t be tempted to do the obvious at Jumpinoff Rock near Milepost 260. Brugh Tavern, Milepost 115 (540- 427-2440; www. explorepark.org). Built between 1780 and 1800. Open Wednesday through Sunday. Try the chicken pot pie. Mabry Mill, Milepost 176 (276- 952-2947). The place for all your picnic needs. Bluffs Lodge Coffee Shop, Milepost 241 (336-372- 4499). A lip-smacking country breakfast, almost 4000 feet up the mountain. 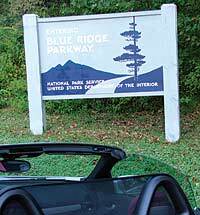 Blue Ridge Parkway Headquarters, 199 Hemphill Knob Road, Asheville, North Carolina 28803 (828-298-0398; www.nps.gov/blri). Blue Ridge Range: The Gentle Mountains, by Ron Fisher (National Geographic Park Profiles). Guide to the Blue Ridge Parkway, by Victoria Logue, Frank Logue, and Nicole Blouin (Menasha Ridge Press). Despite hiccups, the diesel revolution continues, at least on the other side of the pond. Checking out Appalachian nature and history with the top down.